As someone that make their living converting tree (well logs) into firewood I sometimes get questions from people about my thoughts on depleting a natural resource (trees) to be burnt. We source our firewood from sustainable harvesting of trees that would otherwise be cut and left in the forest because they don’t make the “cut” for lumber, pallets, furniture etc. (not straight enough, diseased sections, storm damage, age etc.). Because of how we source our trees I don’t feel guilty about converting them into sustainable, renewable heat energy. However, there is a carbon footprint from the harvesting, transportation and processing of these logs. Now before anyone says “You should pick a different energy source other than firewood” please keep in mind that any energy has a carbon footprint…hydroelectricity requires the infrastructure to convert water to electricity as well as distribute it, solar panels have to be manufactured, so do wind turbines and so on. We’ll keep everyone posted as we plan on planting the weekend of May 13th. Have a great Spring everyone. National Firewood Association or North American Firewood Association? “The NFA cannot defend a smoldering, stinky wood fire. At the most basic level, that’s all we’re talking about. If there weren’t so many people weren’t doing a such a poor job of burning wood, no one would probably ever have brought it up. The increasing availability of clean burning, high-efficiency wood stoves helps. We encourage friends and neighbors to find a way to help offenders understand that they’re wasting wood and suggest that there may be simple ways to significantly improve emissions. Assure them that replacing the stove as the last thing on your mind. Start with verifying the moisture content of the wood being burned. Examine the stove and the chimney. Simple issues like minor air leaks can cause major problems. Get a professional opinion on the chimney. Make sure that physics is on your side. The choice of stove itself is all but irrelevant if these basic requirements are not met — and they frequently are not. The worst part of the entire scena rio is that burning wood could be regulated out of existence before its full potential is ever realized. In summary, if the correct firewood is used (seasoned, which is 20% moisture or less) in the correct wood burning appliance (wood stove, boiler, fire pit etc. that provides enough oxygen for a complete burn) then there should not be any concerns regarding, pollution, particulate or smoke. 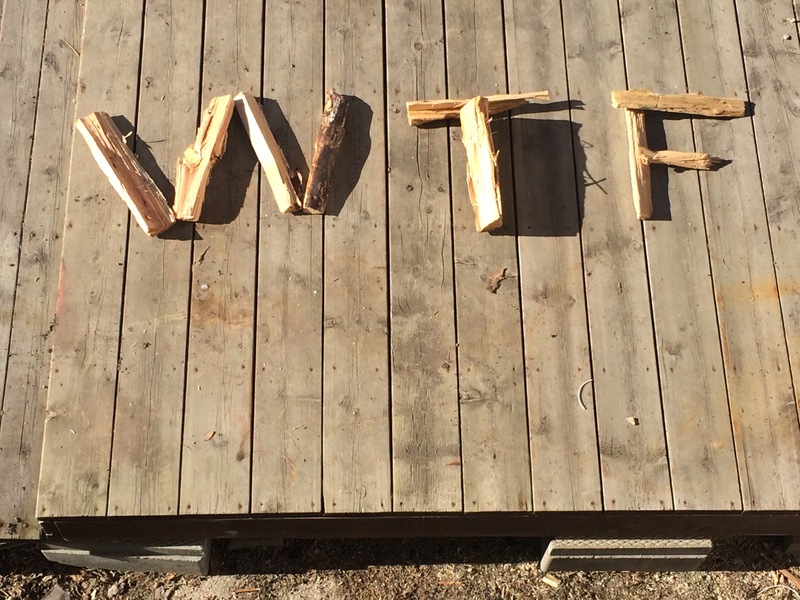 Reddit – Helping folks learn about firewood in Manitoba…or elsewhere. We recently had a customer stop by and pick up some BBBB’s after hearing about us on Reddit. I had heard about Reddit in the past and used it a time or two but now my curiosity was definitely piqued. I looked up some stuff about firewood in Winnipeg / Manitoba and saw some kind words from some of our clients so decided to become an AMA (Ask Me Anything) for firewood. Basically what that is a knowledgeable resource for people to send questions to via the Reddit website…in this case about firewood in Winnipeg and/or Manitoba. One of our passions here at Firewood Manitoba is making sure folks have the answers they need about firewood (how much firewood is in a cord, what is a cord, what does “seasoned” mean, how much wood can a woodchuck…well you get the idea. One of the requirements of an AMA is that you are who you say you are (which makes perfect sense). The purpose for this post is to spread the word about Reddit as a knowledge tool (regardless of subject) and to let the powers that be at Reddit is that I’m the real deal…that is the owner / operator of a firewood processing, supply and delivery service for the past 12 year. Firewood Manitoba…home of Gud Wud! My Reddit AMA username is Firewood_Manitoba and started April 4th, 2017. In our previous post we discussed “hygge” Which is basically a Danish word for embracing winter, be it inside with fire, food and friends or outside not letting Winter get you down. All together that’s a $600 value. Contest starts today (January 8th, 2017) and ends February 10th, 2017. That way you can get your prize just in time for Valentine’s Day…if you like. Entries, questions or anything else can be sent to clint@firewoodmanitoba. Good luck, stay warm and happy hygging! Hygge…a great word for an awesome feeling. Ever sat around a campfire with a summer moon shining down on family and friends, someone is strumming a guitar and you have a cold beer in hand? That’s hygge. Or you come in from a -30C day (not counting windchill) and the wood stove is pumping out heat and you sit around it with a cup of warm tea and some Christmas baking? That’s hygge too. Everyone’s over, the conversation is great and everyone is sitting around the fireplace and the idea of midnight dip in the hot tub is being discussed? Yep…hygge. The article in the link below does a better job of explaining it but to one and all, have a Merry Christmas, great New Year and remember to give yourself the gift of hygge. Pine will treat you fine…. Happy Fall folks…hope this warmer than average weather is being good to you. We often get the question from potential firewood clients “I heard that pine causes more creosote vs. other firewood” or “Pine shoots lots of sparks doesn’t it?”. The answer to both these questions is no. There is not one species of firewood that causes more creosote than another, it’s unseasoned firewood (greater than 20% internal moisture content) that can lead to creosote buildup and in turn increase your risk of chimney fires. By only burning seasoned firewood (pine or otherwise) you are going down the road to a clean chimney, not to mention a fire that is much easier to start and keep burning. Regarding shooting sparks, seasoned pine firewood does not shoot sparks. Resin in firewood can shoot sparks. Resin in pine firewood is residual moisture that is left if the firewood is not fully seasoned (20% internal moisture content or less). As our firewood is guaranteed seasoned you won’t have a problem with sparks shooting out and landing on your floor, carpet, pet potbelly pig etc. Have a good November and stay warm. While having all one species of firewood is useful for consistent burn times it is handy from time to time to utilize the varied characteristics of firewood species. For the Winter Burner Bundle we think we’ve got a good mix but if you’d like to see other mixes in the future please let us know. Ash and oak for smoking? Pine and oak for pizza ovens? You tell us…have a great Fall everybody and stay warm. Visit our booth each long weekend this summer at the Autumn Grove Market. The market opens on May long weekend and runs each weekend until the fall. Visit www.autumngrove.ca for all the details. Location is 90 Lexington Park in North Kildonan just off of Gateway. We’ll be there each long weekend displaying our FireBowls, FireRings, firewood racks and a few new items from the Gud Wud Workshop. Mention you saw this blog post and win a free prize. Have a great summer everyone. Fires…they relax as well as heat. So watching a fire helps the economy by alleviating stress…is there anything a fire can’t do? (yes, it can make toast). Have a good Spring folks. Hi everyone and happy 2016. Now that we’re getting more normal January weather (-28C last night without any windchill) people will be relying on their firewood more and more for warmth and comfort. One tip I recommend to help get the most heat from your firewood you can is to bring your firewood indoors to warm up before burning. This will help in maintaining steady fire and also make your fires easier to start. By bringing your firewood inside at least 24 hours before burning it allows it to get up to room temperature. Burning a piece of firewood that is 20C vs -20C (wood that was just brought inside) will maintain the heat energy your fire already has to heat your home vs. using that energy to warm up the cold firewood to get it to the burning point. It will also ensure that there is sufficient energy in the fire to maintain complete combustion, resulting in more heat energy and less pollution in the form of smoke. If anyone has any questions or firewood burning tip please send ’em my way. Now that the snow is here people’s thoughts inevitably turn to staying warm and one of the ways that can be done is by having a fire. Be it a wood stove, fireplace, fire pit or cooking there is heat created but where there is fire there can also be smoke, though if a fire is burning correctly (hot enough and with seasoned wood) you shouldn’t be able to see any smoke and the level of harmful pollutants is greatly reduced. That is one of the points made in the article referenced in the link below. Though it isn’t a quick read I recommend it to anyone that burns firewood, has questions about wood burning or is thinking about using firewood in the future either for heating, recreation or cooking (or all at once). Thank you for your time and stay warm. Comparing firewood pricing and volume…questions to ask before buying. It’s a busy time of year for us and we like it, my apologies for the delay since my last blog. A firewood dealer, let’s call him Cletus is selling a cord of firewood for $295. His cords equal 180 cubic feet of loose thrown firewood as he doesn’t want to stack every cord he delivers. He’s calculated that 180 cubic feet loose firewood equals just over 128 cubic feet of stacked firewood as firewood that is thrown loosely takes up more space than neatly thrown firewood. What is he charging per cubic foot of loose firewood? What is he charging per cubic foot of stacked firewood? A firewood dealer, let’s call him Stanley is selling a cord of firewood for $275. His cords equal 128 cubic feet of loose thrown firewood as he doesn’t want to stack every cord he delivers and he thinks that 128 cubic feet of loose thrown firewood equals a cord. What is he charging per cubic foot of loose firewood? Answer: If we assume that 180 cubic feet of loose thrown firewood = 128 cubic feet of stacked firewood then 128 divided by 180 = 0.71. So if we multiply 0.71 x 128 = 91 which means you’ll get 91 cubic feet of stacked firewood if you start off with 128 cubic feet of loose firewood. So….$275 divided by 91 cubic feet = $3.02 per cubic feet of stacked firewood. 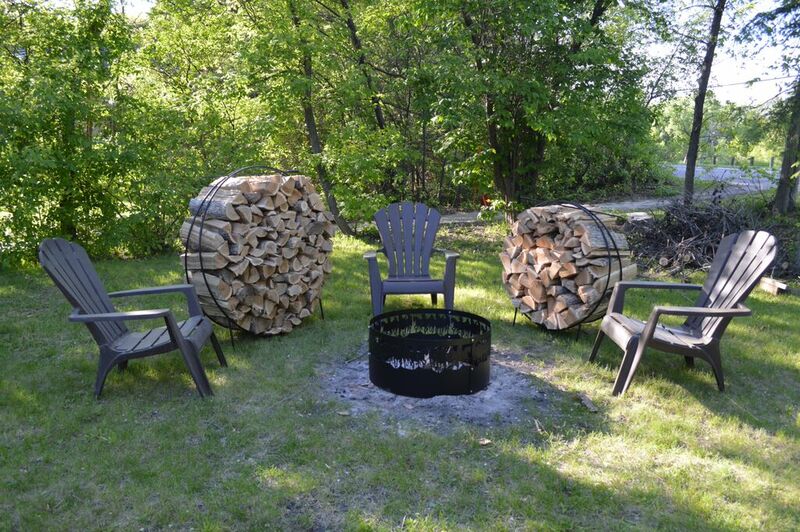 The 48″ circular firewood rack is to the left and the prize 36″ to the right. So from the math above, even though Stanley advertises to be charging less per cord he is actually charging more because he put 128 cubic feet of loose thrown firewood in his truck to equal a cord while Cletus puts in 180 cubic feet in. 3. Can you guarantee your firewood is dry (less than 20% internal moisture content) and if it’s not then what?